Today’s appointment was what they call an intake appointment. This was an hour and a half, where the doctor asked me 10 million questions. If you read my posts about our evaluation at the early intervention center, you know that he acted completely abnormally and was freakishly well-behaved. He contradicted many of the things that I was saying for the first time and it made me feel worried that they may think that I had made these behaviors and delays up. Of course, being the awesome team that they are, they completely understood and apparently see a lot of abnormal behavior in their evaluations. Anyways, to get back to the present, today’s evaluation went much differently. Oliver cried. And cried (and cried and cried and cried). He didn’t want his drink, he didn’t want his snack, he didn’t want his toys, he didn’t want to be held. The inconsolable crying made it hard to remain calm and focused on the doctor. He flapped his hands, ran in circles, spun in circles, got into a downward dog position, closed his eyes when the doctor looked at him, hit me, pushed me, covered his ears, etc. I tried the only thing that I had left and gave him my notebook and pen to doodle with and he was suddenly entranced and allowed our meeting to set forth. She asked me about his health, his diet, his sleep, his behaviors, his tantrums, his triggers, his regressions, his repetitive actions, his obsessive actions, and how he does in certain situations. She really liked that I had been keeping track of every single one of these things and brought a 9 page document full of them all, categorized by Behavioral, Social/Emotional, Speech and Sign, Regressions, and Sensory (I highly recommend that any parent with concerns do this, as it can be extremely difficult to remember everything, as regressions come and go and each day is different from the next). By the end of our meeting she had said that today’s appointment wasn’t even focused on Oliver and she, peripherally, saw a plethora of characteristics that she looks for and that the next two meetings will be evaluations/observations and then the final meeting will be the findings and a discussion of next steps. I feel like we’re headed in the right direction and I must say that it felt really nice to be heard. Oliver and I walked on a trail near Puget Sound before going into the UW Autism Center. We noticed the birds scavenging for leftover lunch crumbs, doctors decompressing, and groups of young people on sail boats soaking up the sun. As I felt the ocean air trace my body, I looked down at my beautiful boy and felt a sense of calmness overcome me. I love my boy with my entire being and while all of these appointments and books I have been reading have been to help me better understand what is wrong with my precious angel, I realized something that forever changed my mindset: there is nothing wrong with my son. While this may feel like a politically correct, “sugar coated” statement, I feel that the line between normal and abnormal is a spectrum in all human beings, including those who are neurotypical. While, yes, he has been facing certain struggles, they are his struggles and his peers have their own struggles that are different than my son and probably different than their friends’ challenges. He IS different, but so is everyone else. I fear for his future in being thought of as “less than” or “weird”, but I know deep in my soul that he is a unique little boy and that the only thing that all of these children have in common is that they are all different from one another. Encourage your children, your friends, your family, and your inner voice to stop thinking of your child as different, and start thinking of your child as different just like everybody else. In about 20 minutes I will be leaving for Oliver’s first appointment of his diagnostic evaluation. This appointment will be about an hour and a half and will be discussing my concerns as well as going over reports from his pediatrician, his audiologist, and his early intervention team. The following two appointments will be two hour observation sessions, and the final appointment will be a comprehensive report covering the neurologist’s reports. I am quite nervous, simply because I don’t know what to expect. Please send good thoughts our way. I will be publishing a follow up post this evening. 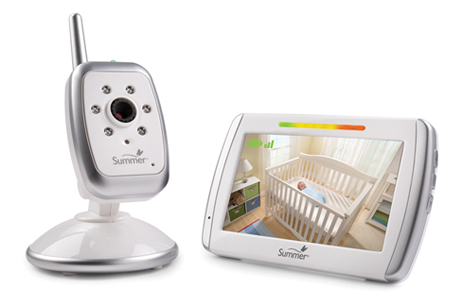 Because 30% of people with Autism Spectrum Disorder also experience seizures, I decided to replace Oliver’s audio-only baby monitor with an audio and video one. I am loving being able to see when he wakes up or what he’s doing if I hear an odd noise. I feel a lot more at ease knowing that I can check in on him without having to go in and wake him up. 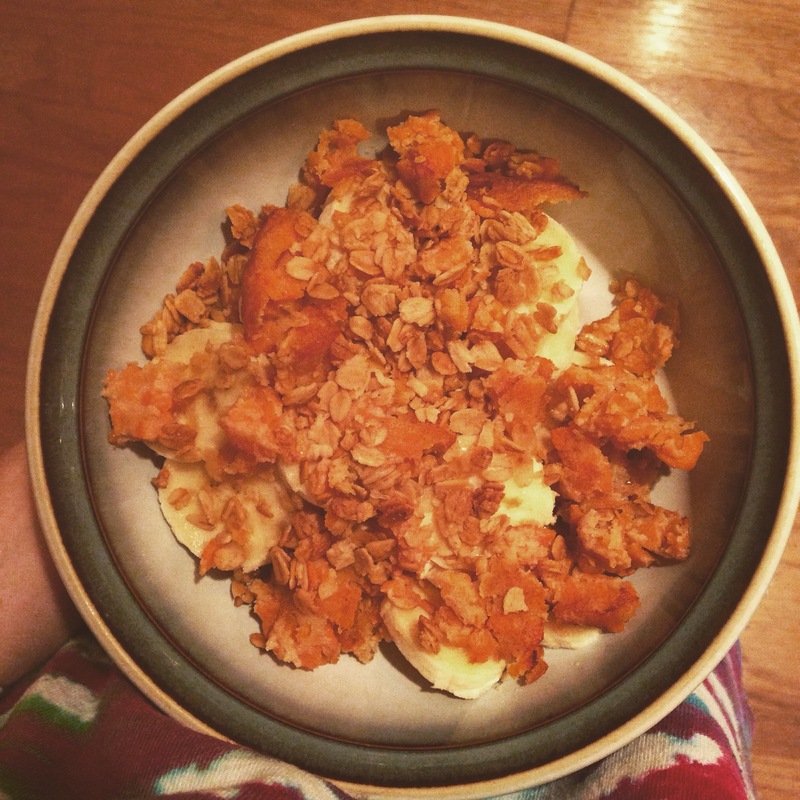 Oliver meal: banana + sweet potato pancake + granola. All organic, GF, and vegan. Hi there! Checkout my page titled “My Bookshelf” to see what I have read, am currently reading, and plan to read soon (all autism-related books). Please comment with any book recommendations or comments on the books that I have listed. Enjoy! I’m interested in following more autism/sensory blogs here on WordPress. Comment below with your (or one you enjoy reading) blog’s URL and I’ll check it out. It seems to me that Oliver is learning more and more everyday that incessant crying gets him what he wants. It is so difficult for me to allow him to cry when I know what he wants. To encourage speech and language development, I need to push him to speak by suddenly not understanding his cries. I need to express to him that screaming and crying isn’t how we ask for milk or for a certain toy. My plan is to, from here on out, tell him, “I’m sorry buddy– I don’t understand screaming. Screaming doesn’t tell me WHAT it is that you want. Can you show me what you want? Can you sign to me what it is that you want? Can you tell me what you want?” I’m hoping that this will improve our current situation. I’m interested in hearing from others who have been in similar situations and how you addressed it.